Avoid paying principal for up to 10 years and buy yourself time to maximize your investment. An interest-only mortgage is simply a mortgage where the monthly minimum payment is just the interest owed for that period. If you have an interest-only loan, you can still choose to make larger payments to the principle of the loan, although if you never make any additional payments, the balance of the loan will remain the same. Since lenders want to make sure debts owed to them are eventually paid off, interest-only mortgages have a limited term, usually between 5 and 10 years. Most interest-only loans are set to convert to conventional mortgages at the end of their term. In a conventional mortgage, as the principal is paid down, interest payments get smaller. 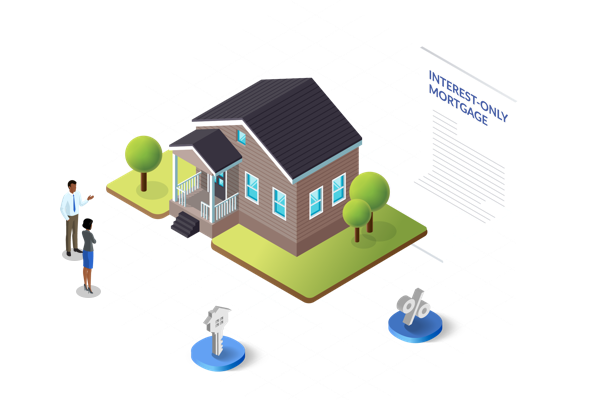 In contrast, the interest payments on an interest-only mortgage remain the same throughout the loan. Essentially, what you are doing with an interest-only loan is paying more over the course of the loan in order to have smaller payments at the start of the loan. This makes interest-only mortgages a good fit for those who want a nicer home now and expect to have much higher earnings within a few years, or for those who have an irregular income. Loans secured by your home equity that require only interest payments for the first period. Pay only the interest for the first period of your real estate loan. Since there is a longer wait time for a lender between the start of the loan and when the principal of the loan starts being paid off, interest-only loans are considered higher risk. 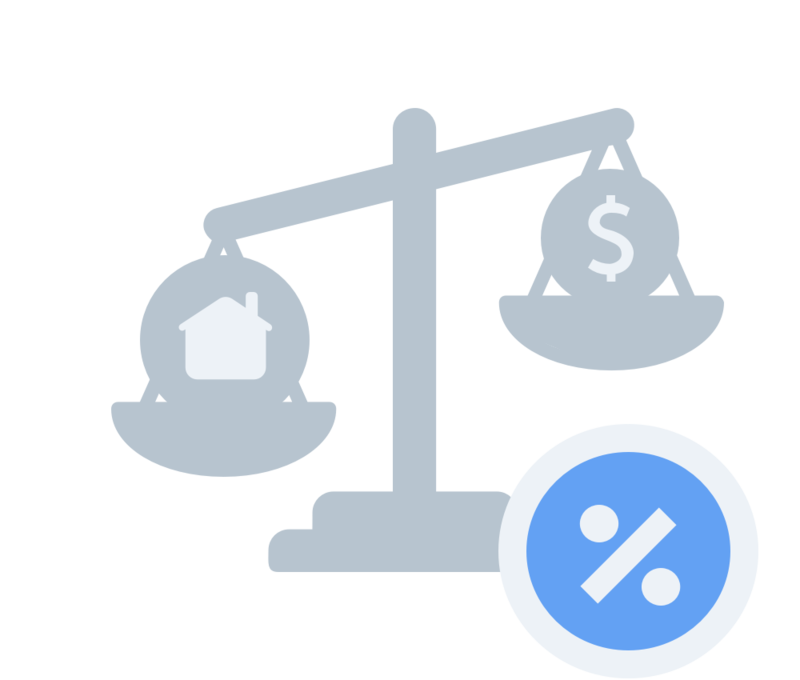 As a result, they almost always have variable rates or rates that fluctuate with the market, which are typically around 0.25% higher than those found on an equivalent conventional mortgage. The length of the interest-only period affects the rate as well. 5-year loans are slightly lower than 7-year loans, and 10-year loans are the highest. If you only look at the rate by itself, you don’t get the whole story of the cost of an interest-only mortgage. With a conventional loan, you pay down the principle throughout the course of the loan. As you pay down the principle, the total amount of interest you have to pay gets smaller. With interest only loan the principle stays the same as long as you only make the minimum payments, so the total amount you will pay in interest over the course of the loan is higher than on a traditional loan with the same rate. If you choose to pay more than the minimum payment, the principle will shrink and with it your future loan payments. Since interest-only mortgages are higher risk, the credit requirements for them are typically higher. The normal range is for a minimum credit score is between 720 and 740 (you may want to see our credit rebuilding guide). Smaller loans and loans with larger down payments tend to have lower credit minimums, but you’ll have a hard time finding an interest-only mortgage with a credit minimum of less than 700. Now that you have all this information you’re probably asking yourself: “should I get an interest-only loan or a conventional loan?” The answer depends on your situation. Interest only loans have higher qualification standards than conventional loans, so if you can’t qualify for an interest-only loan, a conventional loan would be your best bet. you expect a significant increase in your income in a few years and are willing to pay later for some more flexibility now. you have payments on other outstanding debt which will be paid off within the next few years. you plan on flipping the property for a profit before the interest-only phase of your loan runs out. While delaying payments on the principle of a loan can be beneficial in a few situations, if you do not have a good case as to why this delay will help you, it’s probably best to pay more now with a conventional loan, as there are significant savings overall.